I’ve always been kind of iffy on pumpkin ales. They tend to have a compost aroma, and don’t actually taste much like pumpkin—“cloying nutmeg” would generally be a more accurate way to describe them. Garrison, however, never disappoints me, so I was willing to give the pumpkin-beer craze another shot. As the name suggests, it’s more of an imperial ale than a pumpkin one, and that works out just fine. 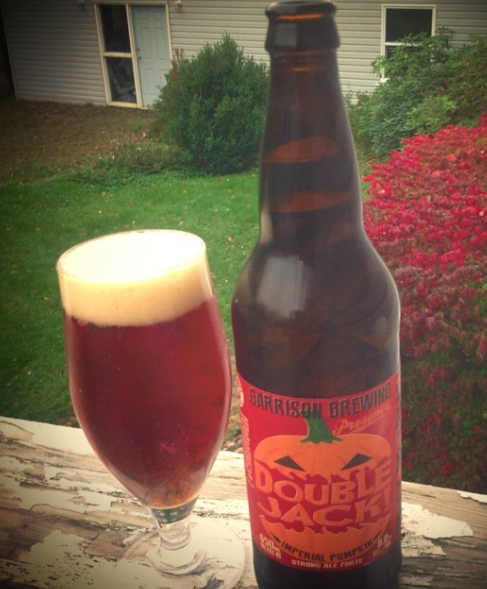 From the brewery: Lordy, Lordy, Garrison gets “Gourdy” with this scary big brew. Daniel carved up “Cinderella” pumpkins from the Dill Family Farm in Windsor, then added cinnamon, cloves, allspice and nutmeg to create pure, pumpkiny perfection! For a limited time, choose “treat” and get to know “Double Jack” Boo! Appearance: Double Jack is a beautiful pour—deep rusty copper with a frothy white head and abundant lacing. It’s gorgeous in the glass. Aroma: There’s a nice, but not overpowering, hit of cloves and nutmeg right off the top, followed by a bigger whiff of hops than you normally get from a pumpkin ale. Taste: That spiciness tweaks the tongue first. It screamed cloves at me, but my wife tasted a whole bunch of cinnamon. The pumpkins join with four different malts (Maritime Pale Ale, Kiln Amber, Munich and Crystal) to create a flavour like sweet potato and marshmallow casserole. The Millennium hops show up during the long slow finish, ending the taste with a grassy but not bitter note. Overall: This is a pumpkin ale for serious beer lovers. It’s nicely balanced—not too sweet, not too spicy, not too pumpkiny. It all combines for a beer that’s unique, well crafted and a grade above most pumpkin ales. You can find Garrison on the web, Facebook, and Twitter. From the brewery: This unique black India Pale Ale is a tribute to the firefighters and emergency service workers who help fight our Canadian wildfires each year. Wildfire IPA is intensely dark and smooth. This black IPA has complex hops that rage through to the finish. Fierce hop, gentle bite! A portion of the proceeds from the sale of this beer go to the Canadian Fallen Firefighters Foundation. Appearance: A beautiful inky black pour—it looks like midnight in a glass. A rich aromatic head, with thick off-white froth and lacing that goes on for days. Aroma: A little hit of wildflowers at first, followed by strong roasty smell—think burnt toast with a hint of sweet malt. Taste: That burnt-toast sensation carries over into the first taste, but quickly gives way to big waves of grassy hops, one after the other. With lively carbonation and a light mouthfeel, it’s much easier-drinking than the aroma or appearance would suggest. Overall: Complex without being overwhelming, deliciously hoppy without going too far—this is a well crafted, nuanced and surprisingly subtle beer. It was a fantastic introduction to the style, and well worth the wait. 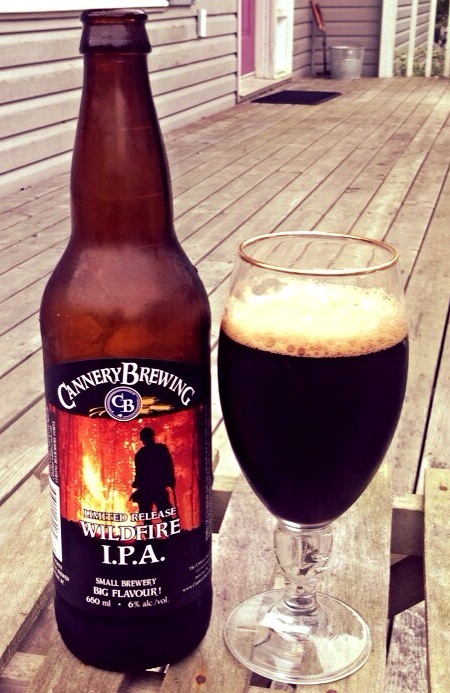 Cannery Brewing Company can be found on the web, Facebook, and Twitter. Brooklyn Brewery is world renowned for producing award winning beers, and this is no exception. 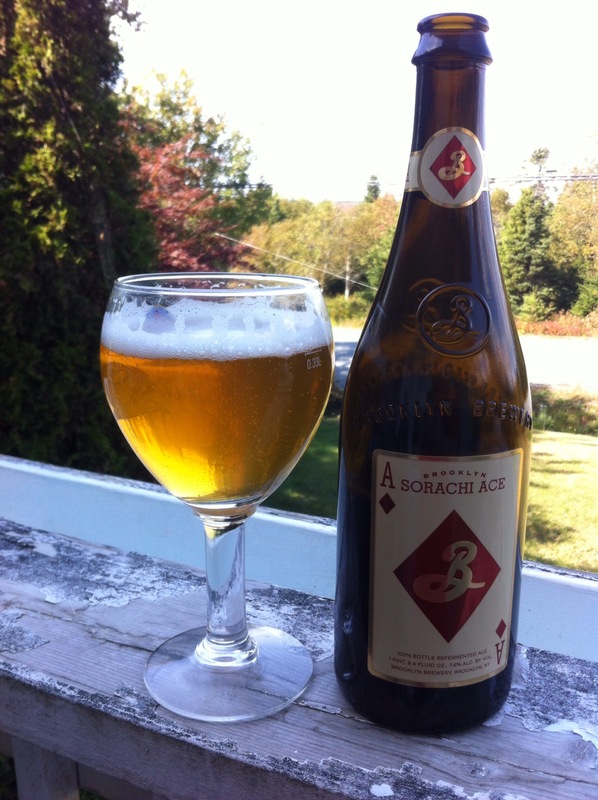 Sorachi Ace is named after the single hop that is used in this beer. The hop was first produced in Japan in 1984 by one of Japans largest beer companies, but was deemed to be a bit odd. Because of its flavour profile it wasn’t widely produced until a farm in Washington state revived it in 2008. Giving a distinct lemon peel, lemongrass flavour and aroma, it’s a standout hop different from all others. Appearance: The colour is golden and clear. Appears to be well carbonated as its quite effervescent. Pours with a fluffy white head that is long lasting. Aroma: Interesting. Had a hard time picking out what this reminded me of, but I knew it was something from my grandmothers house as a child. The aroma is of lemon grass and is wheat-like and floral. Its fairly perfumey with lemon peel and lemon oil. Reminiscent of Lemon Pledge, but not in a bad way (that was what my gram used). Taste: Very unique flavour. The Sorachi Ace hops used are different from any other. There is lots of lemon flavours, best described as peel and lemongrass. There is, once you get past the hops, a nice malt flavour that is supportive and balancing to the hops. Mouthfeel: The body light, lightened by the high level of carbonation. This is an effervescent beer and is a bit prickly on the tongue. Overall: I found this beer to be very impressive. The use of such a unique hop, a showcase even, is unheard of. It’s a bold statement fro Brooklyn Brewery for sure, but they are no strangers to that. A very refreshing beer and an experience every beer lover should have. You can find Brooklyn Brewery on the web, Facebook, Twitter, and Instagram. 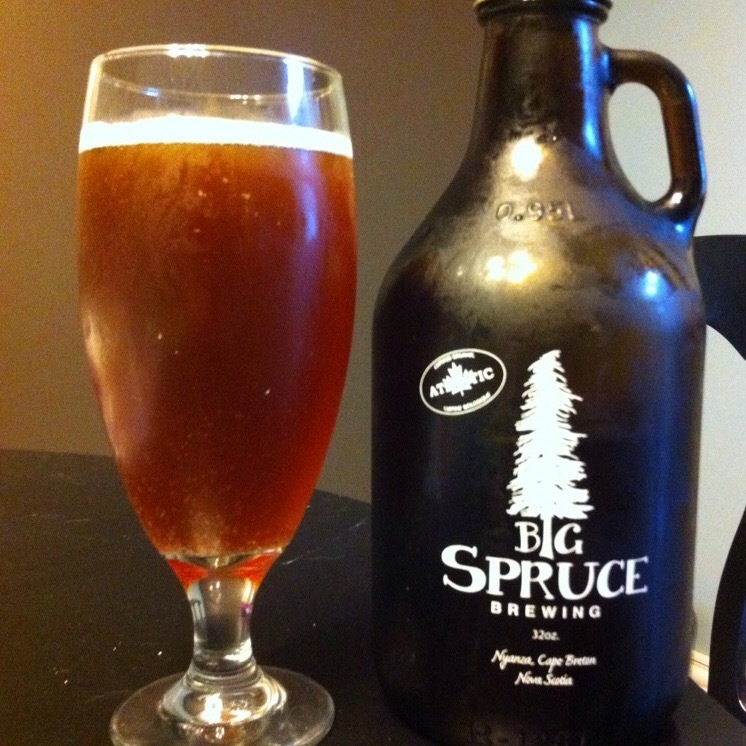 Big Spruce Brewery is a small brewery located on an organic farm located in Nyanza on Cape Breton Island, Nova Scotia. This award-winning brewery can hardly keep up with the demand for their beers. Selling their beers in local farmer’s markets, from the brewery store, and at select tap accounts, this is one small brewery with a big future. Appearance: This beer pours with a nice, but short lived off-white, creamy head. It has a great bit of lacing and is dark red-orange. Aroma: The aroma is hoppy with fragrances of pine and a slight citrus. The smell showcases how fresh this beer is and the wet hops used. Taste: Upfront it’s the hops. The flavour is bitter, orange peal, resin, pine, woody, and tobacco. It really is hops right through and a nice fresh flavour. It leans a bit more towards the pine as it warms slightly and becomes better – the hops are still there, but mellow and smooth out. Mouthfeel: The body is medium with a light carbonation. There is a bit of a slickness from hops. Overall: A very nice IPA, smooth and drinkable, even with the elevated alcohol. Each drink begs for another. Its bitter, but not a palate killer – the more I drink the better this gets. This is worth the trip to Cape Breton. Well done! You can find Big Spruce on the web, Facebook, and Twitter. Started as a brew pub in Toronto, Ontario in 1986, Amsterdam Brewery has continued to expand and produce many fine beers. Mostly available in Ontario, their distribution has started to expand – and this is good news for beer lovers. Making a varied array of year-round and seasonal ales and lagers, Amsterdam is a brewery to look for. 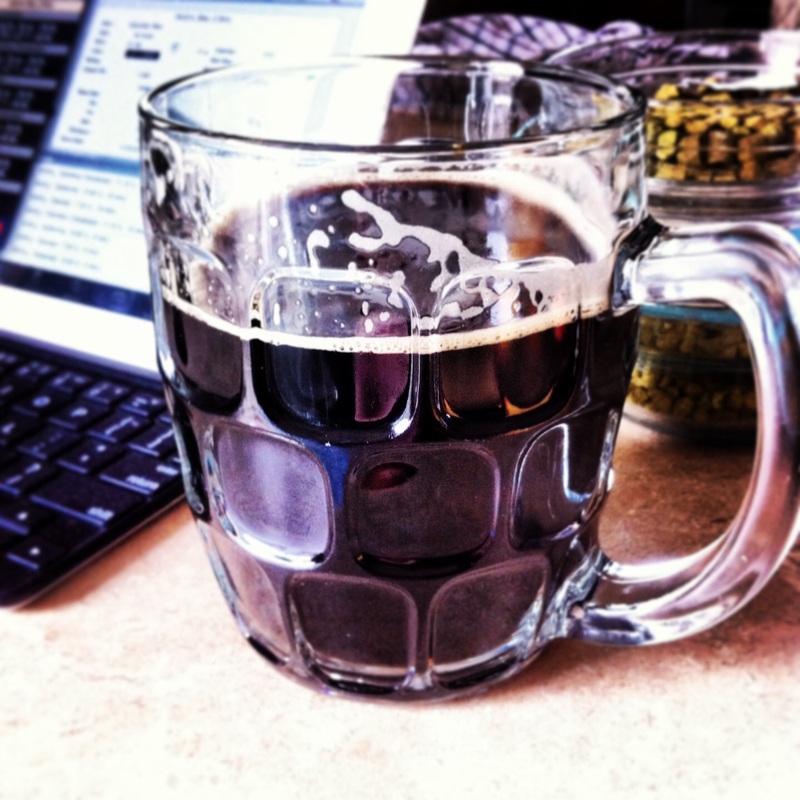 Appearance: This ale pours with a dense, rocky, off-white, big head. The colour is a burnt, dark orange and is a bit hazy, but it is heavy on the hops and unfiltered. Aroma: The first thing that is in the nose is the hops. There is a citrus aroma, most dominated by orange. There are some sweet, toffee-like notes. Taste: The flavour is of bitter orange – the hops are dominate up front. The flavour fades to a malt sweetness with a slight leather flavour. Mouthfeel: The body is medium-light and it’s well carbonated. The body is lightened by the carbonation. Overall: Great balance in this beer. The hops are definitely there, but there is a nice malt backbone to balance everything else. Its a pretty easy drinking beer – not a hop-head’s dream, but certainly an IPA to try. You can find Amsterdam Brewery on the web, Facebook, Twitter, and Instagram. drinknbrew.com Like us on Facebook, follow us on Twitter and Instagram, and be our friend on Untappd.